…body, then discard. For individual use only. No rinsing necessary. Heating Instructions: For optimal comfort, READYBATH can be warmed. 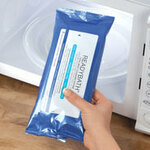 If using a microwave, warm for 30 seconds and test washcloth. Continue to warm until desired temperature is achieved. READYBATH can also be used at room temperature.